Get a high quality garden side table and help us Do Some Good! Side tables and small garden tables are an often overlooked but really useful addition to the garden. Find a cast aluminium garden side table in our range and send us a photo of it in the garden to help us with our charity campaign. As part of our Do Some Good campaign, we donate £10 to charity for every set of photos we receive of your new garden furniture. For photos of a beautifully dressed table, or those including friends or family at a barbeque, garden party etc. we'll up that to £20. Your help goes a long way. So get a pretty and practical garden side table, get snapping, and let's Do Some Good. A metal side table can serve many purposes. As a coffee table to place in front of a patio sofa. Place one next to a sun lounger to keep drinks, snacks and a book within easy reach. Use it to display potted plants or other decorations. A handy surface to keep gardening tools close by. Place one next to your barbeque for your cooking utensils, plates and cooked food. 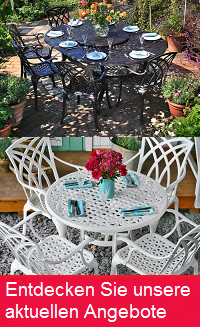 We have a variety of small metal garden tables fit for any of these uses. The epitome of a versatile, multi-functional garden side table, the Sandra table is our most popular side table. It's just as robust and weatherproof as our larger furniture items, so leave it outside all year round without any worries. It's square 54cm2 table top has a beautiful triangle lattice design, and it's 48cm tall. The round Ava table is another of our most popular models. This ornate, sandstone garden table makes a wonderful platform for a potted plant. Alternatively, place it next to a garden chair or bench for your drinks, snacks, sunglasses etc. The garden Console Table is a tall, slim, rectangular side table that's designed to accompany a dining table as a surface to place utensils, condiments and drinks to keep your dining table uncluttered. This Antique Bronze metal garden table is 140cm by 42cm and 72cm in height. The BBQ table is, as its name suggests, the perfect BBQ side table, providing space for sauces, plates, and those perfectly cooked sausages and burgers. A barbecue table is the difference between grilling like an amateur and throwing a superb barbecue lunch. Make sure you have one before your next garden party with friends or family. The BBQ table is 107cm by 54cm and comes in Slate Grey, white, and Antique Bronze. Don't forget to check our clearance page for some incredible bargains on all sorts of garden furniture items. These standalone deals apply to everything, from garden benches to 12 seater table sets. You might even find an offer on a functional barbecue side table. They change all the time, so check back regularly, and if you see a bargain on something you like, get it while you can! Delivery is free on all our aluminium garden tables. So there’s no need to worry about extra charges on the checkout page. Our garden tables are delivered as a large package or on a wooden pallet by our partner couriers Parcelforce or Geodis. Both offer online tracking of your order from the day of dispatch. Geodis will also call you the day before delivery to arrange a time slot that works for you. For details about delivery you can have a look at our delivery information page or give us a call.